A disappointing performance saw Lewes fall to back-to-back league defeats this season, as they suffered a 1-0 defeat at Potters Bar Town, reports Tom Harper. Darren Freeman was able to call upon Leon Redwood and James Hammond, who both missed the FA Cup defeat at Bath City last week through suspension, and also named new signing Declan Appau on the bench, with the midfielder having joined on loan from Woking. There were few chances for either side during an uneventful first half, with the strong wind and bobbly pitch meaning defences were very much on top. The hosts had the first opportunity of the game though, as Eoin Casey saw a wind-assisted long-range free-kick hit the outside of the post. Lewes were finding it difficult to put together any spells of pressure but should have taken the lead through Marcus Elliott, whose close-range header from a Leon Redwood cross was helped over the bar by Berkley Laurencin in the Potters Bar goal. Elliott was involved in any chances that fell to the Rooks, as he crossed for Omarr Lawson to shoot just wide, before just failing to connect with a Ronnie Conlon flick-on himself with only Laurencin to beat minutes later. Lewes had the strong wind behind them in the second half and thought they had taken the lead within minutes of the restart, only for Frankie Chappell to be flagged offside after helping a Redwood free-kick back across goal for Luke Blewden to finish. Defences remained on top for long periods of the half, with both Laurencin and Lewis Carey remaining relatively untroubled. 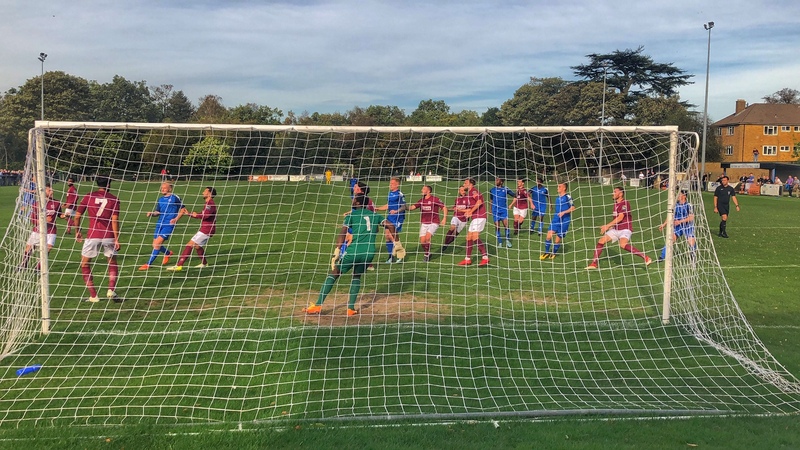 Potters Bar began to apply more pressure as the half progressed, as Casey helped a free-kick towards goal and some last-ditch defending from the Rooks prevented the ball being scrambled past Carey from close range. Just when it seemed as though the game was drifting towards a 0-0 draw, the hosts took the lead after 81 minutes. Lewes were the architects of their own downfall, as substitute Billy Medlock was dispossessed in his own half and after Carey could only parry Billy Adcock's strike from the edge of the area, Casey reacted quickest to finish from close range. The Rooks saw more of the ball as they looked to find an equaliser, but the closest they came saw a Chappell header from a Lawson free-kick go just wide via a slight deflection. From the resulting corner, a goalmouth scramble ensued, but none of the Lewes players were able to get a shot away and Laurencin eventually dived on the loose ball. Potters Bar saw out the final few minutes comfortably and Lewes were left to reflect on a disappointing performance that should still have been enough to secure what would have been a valuable away point in a game of few chances. Darren was obviously very disappointed post-match when he spoke to Barry Collins. The Rooks will hope to put this result behind them when they travel to AFC Hornchurch on Tuesday, kick-off at 7.45pm. Potters Bar Town: Laurencin, Doyle, Lomas, O'Leary, Budden, Brown, Wynter, Forde, Casey, Sach (Fernandes 74), Nicholas (Adcock 46). Unused Subs: Cole, Murray, Vas. Lewes: Carey, Blewden (Medlock 76) , Day, Brinkhurst, Chappell, Redwood, Conlon (Cotton 66), Lawson, Hammond (Appau 71), Dome-Bemwin, Elliott.